O's open in Great Falls - Friday, June 14. Home Opener set for Friday, June 21. 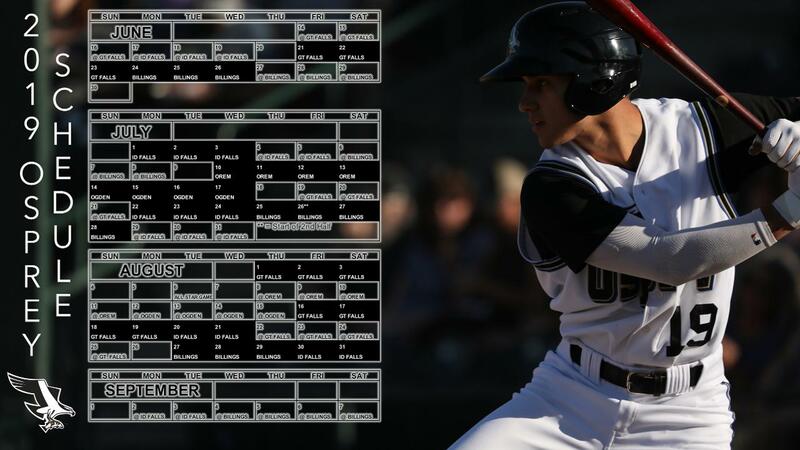 The Missoula Osprey, in conjunction with the Pioneer League, released their game schedule for the 2019 season today. The Osprey will open their 21st season in Missoula with six games on the road beginning Friday, June 14 in Great Falls. The O's home opener is set for Friday, June 21 against the Great Falls Voyagers. In all, over 970,000 fans have watched Osprey regular season baseball at Ogren Park Allegiance Field since 2007. This year, the regular season runs from June 14 to September 7. The Osprey will finish the regular season home slate with a five-game home stand versus the Billings Mustangs and Idaho Falls Chukars August 27 - 31. "We are excited to have a schedule for next season to continue our planning on a fantastic 2019," explained Osprey VP Matt Ellis. "Our staff is working hard at making 2019 one of our best seasons ever. Look for some exciting news in the coming months as our ownership, the Davises, and our staff unveil plans to enhance the Osprey fan experience to be one of the best in baseball."